Racism Doesn’t Just Go Away – Anticipate! Years back, I hung out for a time most days at a Robin’s Donut Shop. I was self-employed in those days and started each morning with a coffee (Robin’s was better than Tim’s) and a read of the paper. The owners of the small shop were Maggie and Tony, a pleasant couple who had come over from Great Britain a couple years earlier. Maggie worked long hours at the shop and Tony less though only because he had a second job as a mechanic. There were a few other regulars of course and for some reason I liked the familiarity of the place. It felt easy. Safe. There was this one guy who was around quite a bit, a suit and tie guy, polished shoes, nary a hair on his head. Sometimes we talked. Mundane stuff really: the Oilers game – well he talked mostly; dodging potholes; and the cost of stuff. Sometimes we just read the paper. “Damn straight,” he said. He said that too loudly so that other patrons noticed and turned. It was somewhat comical I guess. Everyone went quiet and waited for what this white guy would say next. People went back to their business and he leaned toward me and whispered, “It’s those friggin’ immigrants.” He waited, still leaning, for me to say something, but I didn’t. I hoped he would go away and leave me in peace. But racism never just goes away, does it? I am serious. I wanted to chuckle. I actually felt the impulse swirl up from my gut and try to get out of my mouth. I held it back but unfortunately my restraint apparently couldn’t halt a feint grin, you know that small grin that typically accompanies a chuckle. I knew what came next would be coming. It always does with people like that white guy. Llike most racists, he had no time or space for a real conversation. It was more like he was on a marketing campaign to prove immigrants to be some sort of inferior product to the one he preferred. For a moment I envisioned getting up, collecting my things, and saying, “See you, white guy,” — you know with a snarl on my lips — but I didn’t. I felt like many of us do when seeing a bad accident or some kind of tragedy. I wanted to watch things unfold. Also, I knew would be coming next; racists are predictable. However, I was somewhat non-plussed when he slid his chair over to my table. Now, you know as well as I do when someone begins a sentence that way, the truth is in their denial. Like: “I respect your point of view, but…” Yeh, I know you get it. But I didn’t. I figured any kind of challenge would have as useless as suggesting to the Head Poo-Bah of the Klux Klan that his group sign up for some diversity training. What was perhaps most disconcerting was that he didn’t pause to reflect. Actually, he didn’t skip a beat. “How come?” I looked genuinely inquisitive even though I knew the answer. Changing people like this white guy is not easy. Could be it’s impossible. But I figure, somehow, the “rest of us” have to try. We can begin with ourselves of course because, if we are honest, there is racism in everyone. It is indiscriminate, isn’t it, which is ironic, I think. 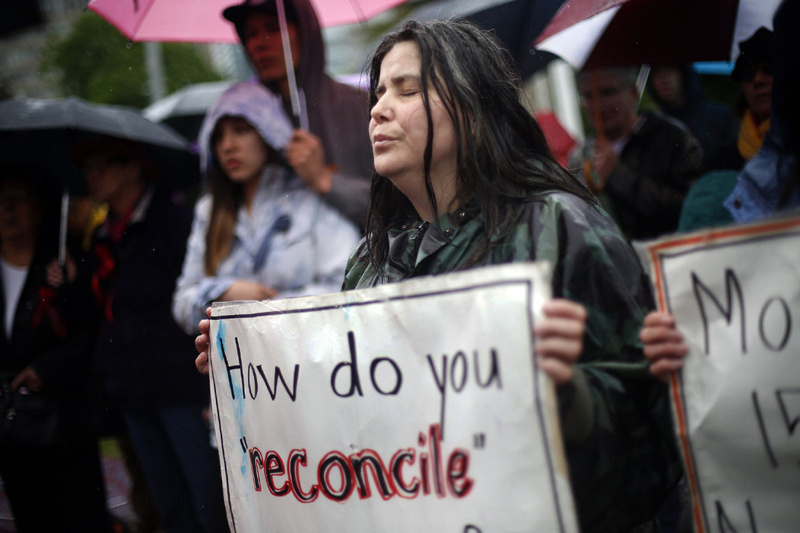 We need to get to that place where reconciliation is possible and then do what we should and must to reconcile, to make our peace with one another, and choose to honour and celebrate our humanity, in all its many colours and expressions. I fear if we don’t do that we will continue to harm one another and we will ultimately lose the fight to end poverty, which we all know is woven tight with racism and discrimination. Today, I am so pleased and hopeful to see ending racism as one of the first game changer listed in the Edmonton plan to end poverty that so many on our Mayor’s Task Force to End Poverty, including me, worked so hard to craft. And just the other day I learned that the Edmonton Community Foundation’s board of directors voted to make stopping racism a priority for the foundation. More inspiring news. Ending racism is about shifting attitudes and biases. It will take time for us to recognize how it permeates society and then what to do to disconnect it from our everyday lives. The donut shop closed down a long time ago. I hope Maggie and Tony are doing well and to be honest, I hope that white guy is doing well too and that the years have softened his disdain for the differences that exist and that we need in our society. I especially hope that because it must be awful to hate others for the colour of their skin, their “strange” customs, their foreign language, and to somehow think that some human beings are lesser human beings. At some level, one has to dislike themselves to be so hurtful and un-open to the richness of life. I overcame the impulse that shivered through my body and walked out the door and into sunlight, the same sunlight that warms all of us, that shines for all of us, that blesses our lives each and every day, no matter who we are, no matter what we believe. Next ›Does Charity Prevent Collective Possibility?